Hello everyone, I hope you all enjoyed Thanksgiving yesterday as much as I did. I finished the chunky knit scarf that I have been working on and here is what it looks like. This will be the perfect scarf to keep you warm. I made it for our annual Christmas Fair that we had at our church last weekend. Unfortunately it was not sold, so I will be saving this scarf for the fair for next year. The yarn I used for this scarf is soft and chunky. For the details on the yarn I used and the book that I am still reading you can find it HERE. I also decided to make the scarf into a regular scarf at the last minute instead of an infinity scarf. I love knitting, crocheting and reading books and I feel happy when I have finished creating something. I usually knit or crochet when I'm watching TV at night. I find it hard to read and finish a book because I'm busy creating which takes up a lot of time. I will be sharing this with these parties and other parties as well. Wishing you all a wonderful weekend and see you next week. I love all kinds of scarves! Pretty scarf! Lovely color and would be so versatile! Great tv watching etc project! Pretty scarf and it looks so cozy. Enjoying this leisurely weekend. You are so crafty and talented. Love the color. Just perfect for Winter dear July...you are one talented and crafty lady! Cozy looking scarf. It turned out great! I love to crochet, knit & sew. I too feel happy when I have completed a new project. Right now I have way too many going - tis the season! 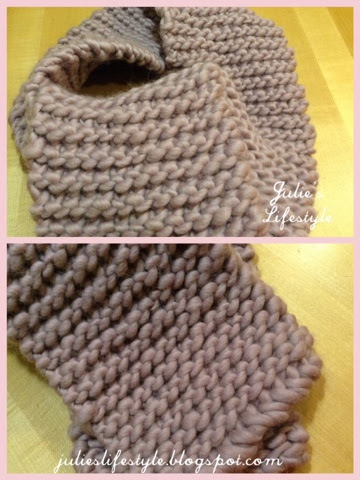 A beautiful scarf, cozy and cuddly, Julie, perfect for your New York winters! Have a lovely December day, my friend! You can knit very well too Julie! Very creative! 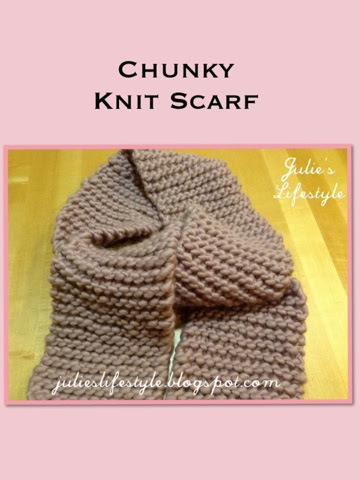 From one Julie to another, what a lovely cosy looking scarf. It looks like it works up really fast, great project to recommend for a beginner.